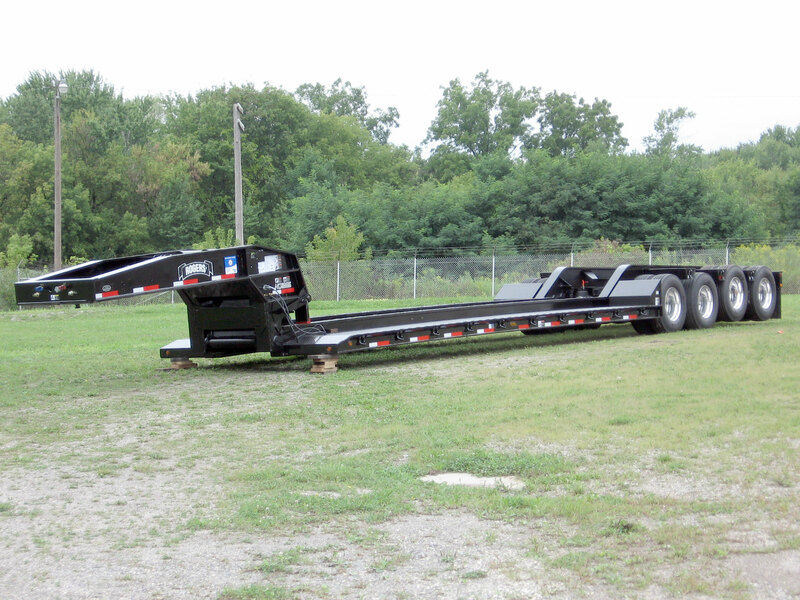 This 75-ton lowbed has the powerful "No Foot"® detachable gooseneck, drop side deck of 1/4" tread plate, and sloped bridge ramps before the tires. Its load concentration is 150,000 lb. in 14'-0" – half the length of the deck. This "No Foot"® is the strong Tower Style non-ground engaging gooseneck. The sloped front end of the main beams is 1/4" tread plate. The "No Foot"® Tower Style has two large cylinders that provide the needed lifting power at low hydraulic pressures. The 4-axle rear frame is equipped with air ride suspension. Air lifts on the 3rd and 4th axles enable the empty trailer to ride on just the first two axles. Air lifts save on tire wear and improve fuel efficiency. Aluminum disc wheels save weight and "
A low, wide "boom trough" makes a loading space for an excavator's boom and increases overhead clearance. LED lights and a rear impact guard complete this trailer.